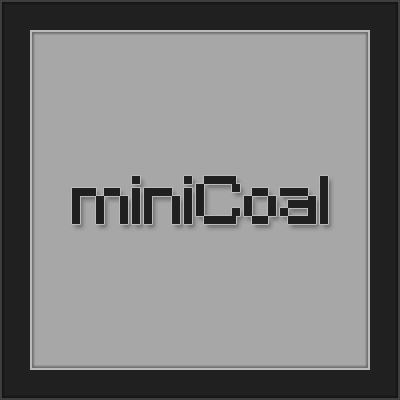 This mod is very simple, it adds two items Mini Coal and Mini Charcoal that cook one item each. I love this mod! Please make for 1.12.2! Yay! Now no fuel will be wasted! Just a tiny suggestion, can you make it so that smelting some wood items like wooden planks or wooden swords produce tiny coal judging by their value in terms of logs? It'd be a great way of reusing accidentally crafted items! Thanks for reading my stupid stuff! Is there a known issue with this mod and Mouse Tweaks or something similar? I'm making my first mod pack (for my personal use) and I can make the mini charcoal, but the next time I go into my inventory, it's reverted back to normal charcoal. Using version 1.10.2-1.1.0 which is the one that the Twitch launcher told me to use with Minecraft 1.10.2 and Forge 12.18.3.2511. If it's logging an error, I have no idea where to look for it, but nothing has popped up.